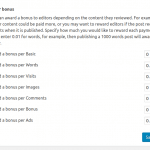 Publisher bonus is an addon for Post Pay Counter and allows you to set up an effective WordPress-based author rewarding system in which users earn a bonus when they publish other people’s or their own posts. 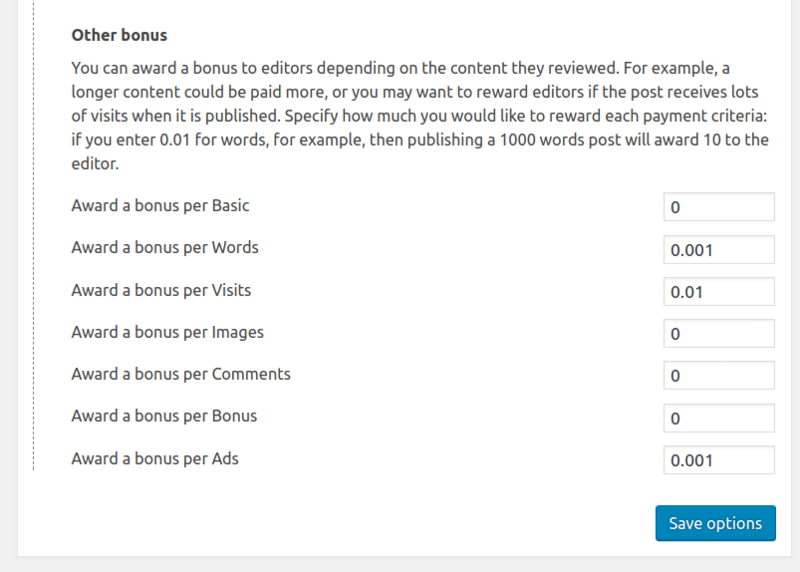 This is ideal for websites with copyholders/proof-readers that need to pay for their services. 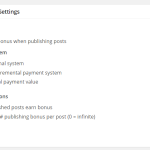 With Publisher Bonus you will immediately know how much you should tip authors who publish posts: publishings information is integrated in the main Post Pay Counter stats table so you always have all countings at hand. In case the PRO version is installed, enjoy integration with payment handling and tracking features, such as due payment and payment history. 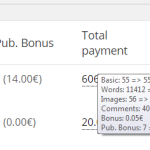 A detailed view of author published posts is available through a convenient lightbox window in the stats page. 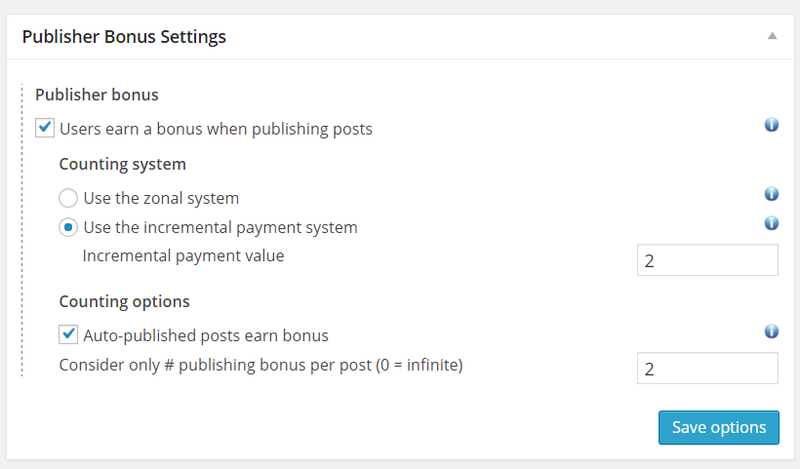 If payment features are available, then already paid posts will be grayed out, so that you always know what is new to be paid. 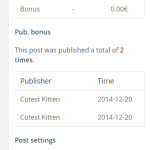 Publishings details for a specific post (who published it and when) are displayed in the Post Pay Counter Stats box in the post editing page (if PRO is installed). 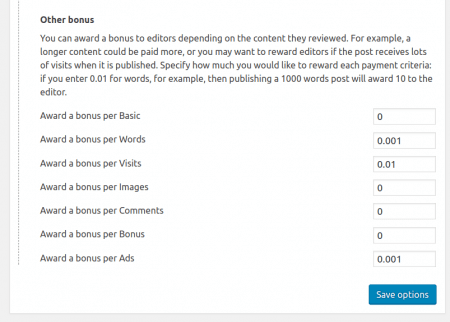 Do you want to grant the publisher a bonus basing on the length of the reviewed post? Or maybe on the number of views it receives? 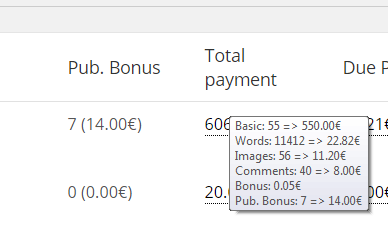 Or on any other metric supported by Post Pay Counter? You can! 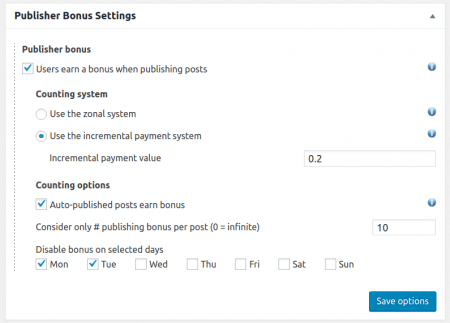 Indeed, you can have an additional bonus for any payment criteria. 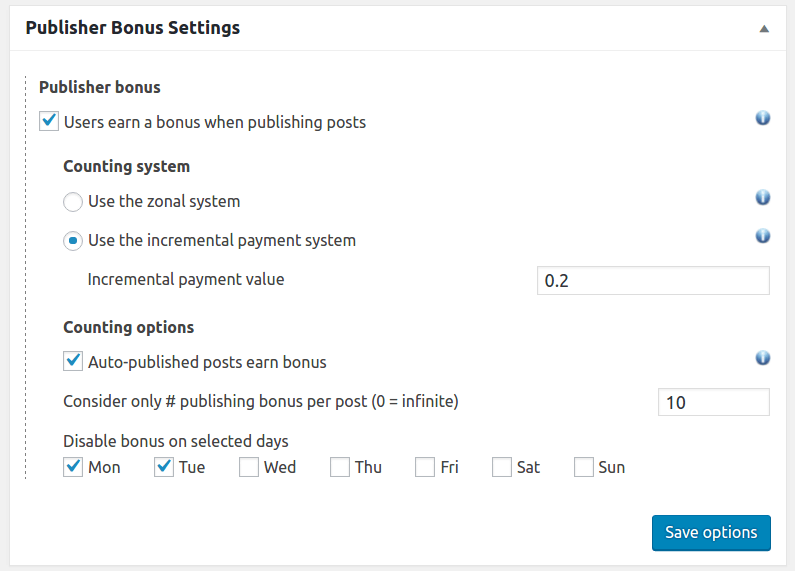 disable the bonus on some week-days. First of all, make sure you have the latest release of Post Pay Counter installed and active. 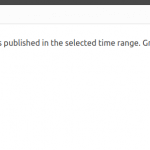 As soon as you purchase the addon, you will get an email with the download link and your license key: download the plugin through that link, extract the zip and upload its content (the whole ppcp-publisher-bonus folder) to your WordPress wp-content/plugins folder. 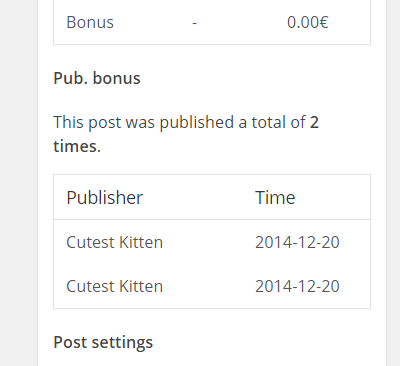 Now head over to your website plugins list page, look for Post Pay Counter – Publisher bonus and activate it. Finally, go to Post Pay Counter > Options > License status, paste your license key in the apt field and hit Submit. You’re done: your license has been activated and you can now enjoy all the new features, which you may set up in the Publisher bonus box (after refreshing the Options page).